Bladensburg Volunteer Fire Fighter Kevin O'Toole received a change in scenery while he continues his recovery from burn injuries he sustained while battling a Riverdale House Fire on February 24. Twenty-two year-old O'Toole was moved out of the Burn Unit Intensive Care Unit to a step down unit. This is an indication that he is progressing well through his treatments. Kevin remains in the Burn Unit and is now in room 3 E 32 at Medstar Washington Hospital Center. This room change will allow additional visitors to spend time with Kevin during regular visiting hours. Kevin and his family members have been receiving support in many different ways from friends, fellow firefighters and the DC Firefighters Burn Foundation since his admission 4 weeks ago. Many others have asked how they can help. If you are interested in providing a lunch or dinner at the hospital for Kevin and his family you are asked to contact Robert "Bobby" Wells at robw6351@yahoo.com. Bobby will be coordinating efforts with members of the fire service and the DC Firefighters Burn Foundation. 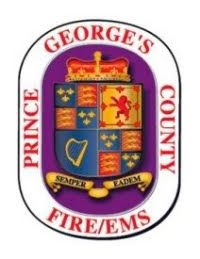 The O'Toole family and members of the Prince George's County Fire/EMS Department and Bladensburg Volunteer Fire Department and Rescue Squad, Inc. thank everyone for the thoughts, prayers and acts of kindness and support during these past four weeks. The Fire/EMS Department continues to review and investigate all aspects of this incident that resulted in injuries to Kevin O'Toole and six other firefighters. A complete report will be made available once all reviews are complete. The fires has been classified as an Arson and Fire Investigators continue to seek information from the public about who is responsible. We are asking for the community‘s involvement and assistance in helping to identify the person(s) responsible for setting these fires. If you have information about either of this incident, call Crime Solvers at 1-866-411-TIPS (8477). You may also send your tips, SECURELY and ANONYMOUSLY, via TEXT MESSAGE by typing "PGPD" plus your message, and sending it from your cell phone to "CRIMES" (274637). If your information leads the capture of any of these fugitives, you may be eligible for a CASH REWARD up to $1,000.